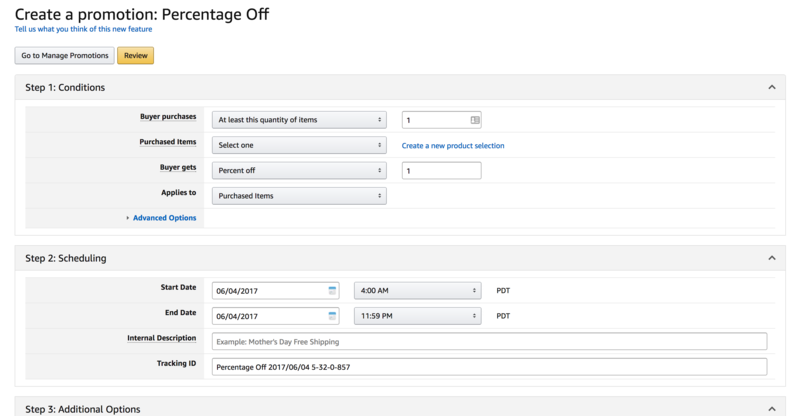 In this article I give you a run down on Amazon coupon codes and also provide a step by step guide on how to create coupon codes in SellerCentral. There are two types of Amazon coupon codes. Single Use Codes and Standard Coupon Codes. I want to take a minute to quickly explain the difference between single use coupons and regular coupons on Amazon. Single Use Codes: These are codes that can only be used one time. That means once it the code has been used no one else can use it again. These types of codes are useful when you want to limit the distribution of a code. Standard Coupon Codes: These coupons are available for anyone to use. You create one coupon code and anyone can use it for a discount on your product. This is risky as anyone who gets the code can claim a discount. If we are offers large discounts we strongly recommend you do not use these coupon codes. From the homepage, click on “Advertising” then “Promotions” on the top navigation bar. This will take you to the promotion page. Next, you will see a couple different options to choose from. For single use codes and just about everything else you will need, choose the “Percentage Off” option. I am going to breakdown each section of this page as this is where all of the most important information is needed. The first section we will talk about is the conditions section. Buyer Purchases: This is what the buyer must do to get this promotion. I would leave it as-is with the “At least this quantity of items” to 1. Fill out the next page. The first two slots are for your tracking purposes only and name them what you would like. In the “ASIN List” section, input the ASIN number of the product you want to run the promo for. Buyers Gets: In this section, you need to decide how much you want to discount your product for this promo. Previously you could select $ off and % off. Unfortunately Amazon removed the $ off option. Applies to: This is where you choose what this discount applies to. I would stick with the “Purchased Items” selection. Start Date: This is where you choose what date the promo code becomes active. You can click on the calendar icon and then click on the day you want to start. End Date: This is where you choose when you want to end the promo. Internal Description: Name your promo code. Name it something that you will be able to recognize later on. Claim Code: We recommend you select Single-use if you want to run promotions in AMZPromoter. This is the safest option as you get to control how many coupon codes are claimed. One Redemption per Customer: Check this box. Claim Code: This is the code people will enter to get the discount, however, since we are creating single use codes this claim code then this option won't be enabled. Claim Code Combinability: Choose the “Exclusive Option”. Custom Messaging: This is not applicable with Single Use coupons. Quantity: If you were doing a 100 product launch, then create 100 single use codes. This make sure that the maximum amount of codes that can be used is 100. This keeps you and your product safe from your coupon codes getting into the wrong hands. In the campaign wizard under the Coupons tab press Select File and then locate the txt document that holds your coupon codes. Press submit and then you are done! NOTE: When you download your coupon codes from Amazon they will come in a .zip file. You must extract the .txt in this .zip file before uploading your coupon codes to AMZPromoter. You now have single use codes that you can use with AMZPromoter to promote your product!